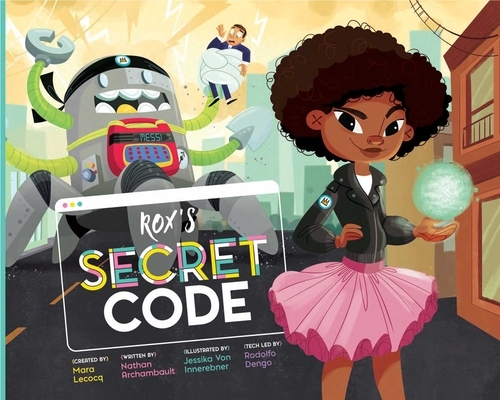 A coding adventure about a brilliant inventor and her runaway robot, Rox's Secret Code aims to inspire the next generation of female leaders in STEM! Rox is happy to spend the whole day on her laptop inventing awesome robots, but her dad wants her to clean up! When the Chorebot she designs gets a mind of its own and tries to organize the whole city, Rox and her neighbor Amar race to recode Chorebot in time to save the day. After you’ve read Rox’s story, look to the last page for instructions on how to download the free Secret Code app, designed by the coding geniuses at Electric Factory. Install it on your smartphone and unlock a coding game that allows readers to design their own augmented reality robot and see it come to life on the front cover of the book! Through these custom creations, children will be introduced to the basics of coding by playing with coding values and actions. Rox’s Secret Code and its app unite traditional and digital storytelling with educational entertainment, inspiring children to become makers of technology: a world full of creative possibilities for their futures. Mara Lecocq is an entrepreneur with a mission to empower girls and women through initiatives that bring together creativity and technology. Formerly a creative director in advertising and technology, Mara was one of the only female leaders in her field to create digital products and campaigns for brands like Nike, Starbucks and Verizon. Realizing that ambition starts young—studies showing that stereotypes have an impact on children’s aspirations before the age of 6—Mara decided to found Secret Code. It’s a customizable children’s media company that makes girls see themselves as heroes of powerful industries, with stories customized to their name and their appearance. Mara won a grant by Sophia Amoruso’s Girlboss Foundation and a spot at the startup pitch competition Project Entrepreneur, by the Rent The Runway Foundation. Rox’s Secret Code is their first published book. Mara wants to empower the next generation of diverse tech leaders by making coding and robotics fun and aspirational for girls of all ethnicities in their formative years—with an inspiring story and its coding game to get children’s paths to fulfilling futures started right away. Nathan Archambault was raised in Rhode Island and attended Syracuse University, where he received degrees in Advertising and English. He's the author of Rox's Secret Code, a picture book that inspires kids to get into coding and become the tech leaders of tomorrow. After spending brief stints living in Washington, DC, and Chicago, Archambault settled in New York City where he works as a freelance creative director and copywriter in the advertising industry. His work has been recognized by D&AD, the Cannes Lions, The One Show and Time Magazine. He now lives in Hastings-on-Hudson with his wife, 2 daughters and Boris the English Bulldog.